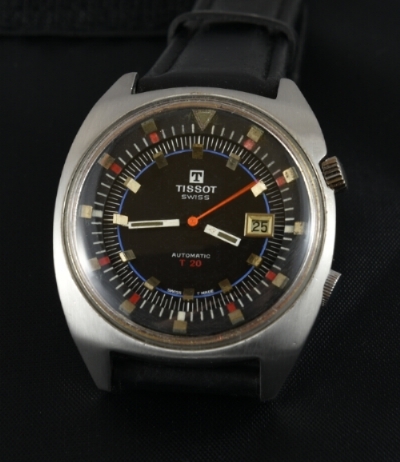 This is a vintage 1970’s TISSOT T20 measuring 42mm. across in steel . This vintage and large dive watch has a rotating inner bezel feature to keep track of events. The black dial and baton hands are original. The automatic winding TISSOT movement was just cleaned and is accurate. We replaced the crowns after photographing this watch, with ORIGINAL signed TISSOT logo crowns. Keep in mind, TISSOT was owned by OMEGA during the production period of this watch. $1250.